Born in October 1995 the Nottens Female is on the verge of turning 16 years old. Seeing this female really does give you a feeling of being in the presence of greatness; made all the more special by the fact that her mother was the famous 3:4. 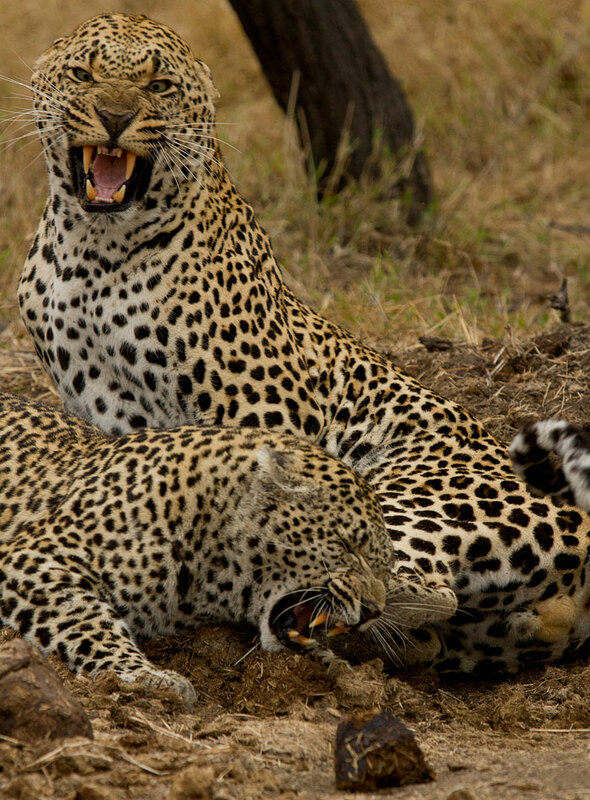 She continues to patrol the central sections of Londolozi and is often seen in the old haunts of her late mother. As far as I am aware she is the oldest leopard in the Sabi-Sands! Rangers and trackers search game paths hoping to see the tell-tale track of Nottens; finding her is like hitting the jackpot.The question is…at her old age will we see her have one last litter before her days are up? She was recently seen with the dominant territorial male known as Shorty. He was anything but excited when she presented herself to him, trying to convince him to mount her. In fact he showed quite a lot of aggression towards her almost as if he was not interested in mating with her. It was fascinating to watch as she repeatedly tried to force him onto herself. Why was he not keen? For male Leopard’s the continuation of the bloodline is paramount so what would make a male leopard turn down the chance to do so? Is it that she may be too old? Is she possibly infertile? Or maybe we just saw this mating session in the early hours of the courtship? I do not have the answers but it makes one think…out in the wild, and away from the zoos, do leopards get to the point where their age catches up with them and they stop reproducing? Do they reach a point where in their old age, for the first time in their lives, they can live their life for themselves and not in trying to ensure their progeny are safe and well fed? Was she attempting to mate in a real attempt to fall pregnant or is she merely doing so to keep the Short-Tail Male happy and content? Or does she know any other way? Don’t you love it how nature is filled with so many questions? Below you will see pictures of Shorty and Nottens on three occasions…2009,2010 and 2011! on Is the Nottens Female too old to mate? Hi Iren; how old do you think Safari is? You may indeed be correct! Let me know 🙂 either way Nottens is defiantly one of the oldest! wow. it says second. oops. Absolutely sensational footage! That sound is just amazing. Ths male is probably saying to her “youre old enough to be my mum” she has not to like to the comment so they have had an argument lol. Some great footage and nice pictures of the happy couple from years back. 16 yrs is pretty special so cherish the moments. I thought 11 was old for a leopard in the wild. Keep up the great work guys. Really well done – fantastic that you have images from multiple years. The video is amazing and sad too… Hope that she does get to have another litter. When we were at Djuma in August, 2003 (same trip as to Harry’s Camp), we saw Safari who they said was about 8 or more years old. So she would also now be 16+ years old. How old is Shorty? Is he too old? She still looks like she’s got it to me! Amazing video. Hi Brad, Shorty is between 11 and 12 years of age. Definitely not too old to mate, perhaps just disinterested in the Nottens female for the time being.